SAN RAMON, CA--(Marketwire - February 1, 2010) - Accela, Inc., the leading provider of Web-based and mobile software that makes government services available 24/7, today announced the availability of Accela Automation® 7.0, the newest version of its flagship enterprise application. The new release's innovations in data management, geospatial mapping, and mobile technology are designed to boost the ability of governments to streamline critical tasks -- such as permitting; licensing; code enforcement; community planning and development; asset management; and emergency response -- while offering greater self-service capability for citizens via the Web. In an era that requires governments to do more with less and improve transparency, Accela Automation 7.0 facilitates more citizen-centric, performance-based government that brings traditional counter services directly to the public. Accela also announced the availability of Accela Mobile Office™ (see related news release), a new product designed to pave the way for traditional government counter services to be brought directly into the community -- improving turnaround time and increasing citizen satisfaction. Accela Mobile Office extends the processing capabilities of Accela Automation 7.0 for field-based inspections, work orders, and service requests, and offers touch-screen capability for ease of use. By giving mobile government workers all data, tools and maps used by back-office staff, in a simple and flexible user interface, Accela Mobile Office eliminates the need for data entry at the office and fosters flexible government teams that are un-tethered, yet connected and empowered. "Accela Automation 7.0 contains innovations that benefit everyone -- daily office users, mobile workers, and administrators -- as well as numerous time-saving feature enhancements," said Rebecca Blair, Systems Administrator, with the City of Sacramento, Calif., which has deployed Accela solutions for several years to help enhance operations and services across its Building, Planning, Transportation and Code Enforcement departments. "Since all governments are under staffing pressures these days, every task that technology can streamline becomes crucial to providing effective, timely service to the public." Management, mapping and mobility tools are centerpieces of the advancements in Accela Automation 7.0. These strategic innovations have been developed to help agencies deliver their services more quickly, easily and cost-effectively, and to provide citizens with greater access to government. For administrators, Accela Automation 7.0 offers new functionality for easy configuration of all systems data -- including records, inspections, fees and reports -- to match individual agency and business processes. Accela Agencies can also create consoles targeted to specific job roles, so that users see only the information they need to efficiently do their jobs. The application's open architecture and use of a centralized database also allow information to be shared across systems and departments, which can pave the way for shared online services across jurisdictions. For office- and field-based workers, the Accela GIS™ 7.0 product infuses geographic information system (GIS) capability into the Accela Automation 7.0 experience, providing access to an agency's entire map roster from the jobsite. Users may also integrate geographic data from multiple sources (e.g., ESRI's ArcGIS® Server or Bing Maps) into their daily tasks -- such as creating a permit or initiating a work order -- and to start any task directly from a map. Built-in routing capability displays the shortest distance between work assignments, allowing mobile teams to plan and modify their routes throughout the day for maximum efficiency in time and fuel. With map control tools built using Microsoft Silverlight 3 web application framework, users enjoy a consistent map-centric experience, whether in the office or field. For business owners and the public, Accela Citizen Access™ 7.0 extends the benefits of Accela Automation 7.0 even further, by allowing citizens to apply and pay for all needed permits with a single online shopping cart from home or office, and even to access their permits and applications from their smartphone -- all via the same, intuitive user interface. Additional tools in Accela Automation 7.0, such as standardized comments, ensure that data integrity is maintained across teams and departments, while the application's global search capability and personalized user interface make data and information easy to manage and find. "Performance-based government is no longer just a vision, it's an economic necessity," said Maury Blackman, CEO and President of Accela. "Government agencies today -- be they federal, state or local -- are looking for new ways to improve their operations and deliver better services, while citizens increasingly expect to access government services day or night. Technology that synthesizes the needs of administrators, workers and the public is the future of effective e-government." Accela Automation 7.0 is available in five modules that support key government functions. These modules can manage the core business activities of a single department or work as an enterprise solution to manage the services of an entire jurisdiction. Accela Land Management™ -- tracks and manages the land use and community development activities that promote economic development, such as: permits; inspections, investigations and reviews; zoning; project plans; building safety; and code enforcement. Accela Asset Management™ -- provides an automated solution for costing, parts inventory, maintenance scheduling, inspections and investigations for a broad range of community assets and resources, including: water, wastewater and storm water systems; street transportation; treatment plants; parks and recreation; public works; and more. Accela Licensing & Case Management™ -- automates and integrates a wide range regulatory process associated with professional licensing, including: registrations; complaints; and enforcement activities and processes; and alcohol beverage permits; among others. Accela Public Health & Safety™ -- tracks and manages the permit and inspection activities that ensure community health standards are upheld and environmental health regulations are enforced. Accela Service Request™ -- automates and manages interdepartmental or citizen service requests, complaints, or inquiries, providing an effective way to strengthen citizen relations. Add-on products bring additional functionality to Accela Automation 7.0 by facilitating citizen access and self-service options (Accela Citizen Access); integrating geographical information services (Accela GIS); providing interactive voice response (Accela IVR™); and equipping field-based teams (Accela Mobile Office). Taken together, the Accela Automation 7.0 product suite provides a robust solution for nearly every aspect of government service, delivering multiple daily efficiencies that add up to major savings in staff time, resource management, and expenditures. Accela Automation 7.0 is available now. Additional information on procurement and pricing options is available at www.accela.com or info@accela.com. Accela, Inc. is the leading provider of Web-based and mobile software applications that make government services available 24/7. Accela's solutions automate licensing, permit, case, and asset management processes for local, state, and federal government agencies of all sizes. Backed by 30 years of development and implementation in more than 500 agencies worldwide, Accela software manages more types of regulatory government transactions than any other solution. Accela products and services empower agencies to increase efficiencies, reduce workload, and provide the public with more convenient access to government services. Accela is headquartered in San Ramon, Calif., with international offices in Melbourne, Australia; Abu Dhabi; and Beijing. Additional information can be found at www.accela.com and on the Accela Community site: http://community.accela.com. Media may visit http://www.accela.com/company/newsroom.asp. Accela Automation(R) 7.0 is a Web-based, enterprise application that helps governments automate critical tasks such as permitting; licensing; code enforcement; community development; asset management; and emergency response. Advanced GIS mapping technology is infused throughout Accela Automation. 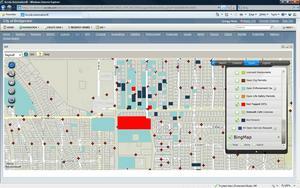 Dynamic query capability categorizes information on maps using pre-defined colors and symbols.